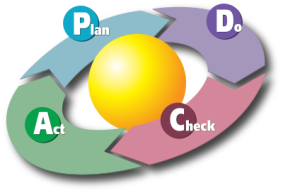 The Plan-Do-Check-Adjust (PDCA) cycle (also called Plan-Do-Check-Act) is the best-known decision cycle model for improving organizational processes and outputs. That makes it a model all foresight professionals should learn. It was developed by statistician W. Edwards Deming while working in 1950s Japan, where his cycle and his statistical approaches to quality became one of the pillars of the continuous improvement, just-in-time Toyota Production System. In the last two decades, the Toyota system has become more generally known as lean manufacturing. For more on that, see Jeffrey Liker’s The Toyota Way (2003). Though we will call it the Deming cycle as that is its most popular name, Deming called the PDCA cycle the Shewhart cycle, because he adopted it from statistician and quality pioneer Walter Shewhart’s work in the 1920s. Shewhart in turn got it directly from the scientific method, as he realized that a cyclic process of hypothesis, experiment, results, and critique of results was the best way to reduce variation and waste in manufacturing output. Other scholars after Deming renamed the Act step to Adjust for more clarity (and to distinguish it from the Do step), and added Observe as a fifth step at the front of the cycle, giving us the modern OPDCA cycle. The first step stresses the need to Observe (learn the current condition) prior to creating any plan. As Shewhart would say, careful Observation is always the first step in the scientific method, which next involves forming hypotheses, and then Plans for experiments to test each hypothesis (Observe-Plan-Do-Check-Adjust). By understanding the scientific heritage of the OPDCA cycle, we see that it is most fundamentally a learning cycle. OPDCA is not just a “quality cycle,” as some management scholars have mistakenly pigeonholed it to be, but a much more fundamental and powerful process. Managers can use the OPDCA learning cycle to advance almost any agenda, not only quality but also goals like intelligence, performance, competitive dominance, efficiency, sustainability and innovation. Let’s look now at two more OPDCA variants to see how we can use the cycle to pursue some of these latter agendas. 5. Kotter's Eight Steps of Change Mgmt.